Hang Out with Mentawai Locals! Multilingual, Carpenter, Surfer, Entrepreneur, and Owner of the only locally-owned upscale resort in the Mentawai islands. Born and bred on the island of Siberut. Ade grew up in a different world than most of us did. He found his inspiration by meeting fellow surfers traveling to the Mentawais. The boom in the surf-tourism in the Mentawai islands played a major role to Ade’s life. He receives this blessing with humbleness and gratitude, which he shares with every single visitor. Ade speaks fluent English, Indonesian, and the Mentawai dialect. But his desire to learn seems to just keep growing in him, so he learned Spanish from his girlfriend, Laura. It’s impressive to observe how someone who grew up on such isolated region can understand the expectancies of foreign clientele, while conversing in their own language. He lives for his passion, family and friends while pursuing his dream (an uncrowded world-class wave in its back-yard). He offers his hospitality to any surfer who shares his dream. Read also here: Surf Coaching Retreat in the Mentawais – happening next month of October 2019. It all started with one fishermen boat. 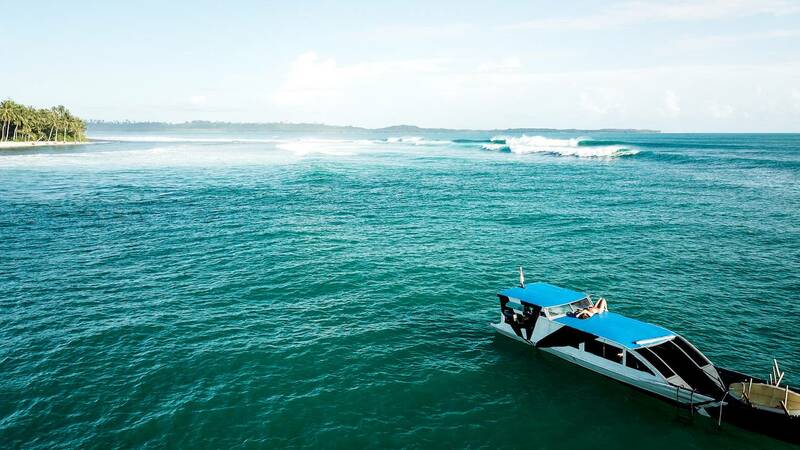 “Shadow” started over a decade ago when Ade was organising surf boat services to bring foreign surfers around the different surf spots of the Mentawai islands. Ade’s hard-work led him to become the owner of nine boats while supported by family and friends. Ade has many different vision to his business, he dreams big and finds a way to get the results. After building his amarda, Ade sold his boats and bought an island. The only inhabitants on the island are his family, him, and a coconut farm plantation. Building A Surf Resort from the Sand Up! Ade and his family lived rustically. Every night was filled with the smell of lit bonfires, tasty coconuts, and when dusk hit, a blissful tent to comfort a hard day of work. It started with a bungalow 8 years ago – not any bungalow, but a beautiful and spacious one where you can fill the wood has been carved with love and talent. Today, Shadow is an all inclusive surf-resort with premium accommodations, AC, Hot Water and even a WIFI connection. Don’t look further, everything you need for happiness is right where you are. TRUST and the rest happens! All the staff are family. Papa the boat captain, Dody (his brother) teaches surf-lessons with the help of the cousins. All of them have incredibly charismatic personalities and made us feel warmly welcomed. There are two waves, Shadow’s right and Shadow’s left. When the stars align, these World-Class waves have nothing on the Macaronis, HT’s or Kandui. Shadow’s right is considered one of the bests of Mentawai. While we stayed there, a South African guest who is a regular traveler to the Mentawai’s for the past 10 years commented ‘When Shadow’s right awakes, this is the best wave in the Mentawais’. Best time to surf in Mentawai? You’ll have higher chances to see those waves working anytime between April to October on a South Swell > 4-6ft, which happens pretty often! Want to live the Mentawai Experience and Surf with Ade? - Fill in the form below. Surfing Mentawais - Where to Stay? When to go? What to pack? He bought an island! What a boss haha. That’s such a cool story.